No time to read? The infographic below summarises all the information you need. Of course, providing great help in a scalable way is a careful balancing act. If our team would simply solve every customer question by phone, it would need to triple - or quadruple - in size. It would also be answering a ton of repeat questions. 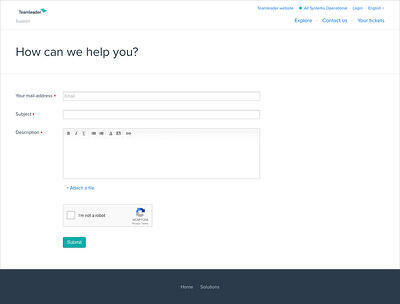 As we’re convinced local, top-notch support is the only customer-centric thing to do, we’ve set up a more scalable way to manage customer requests. Tip: if you visit the Knowledge Base, you’ll come across the term ‘support tickets’. Each customer question we receive is called a ticket. Whenever a new question is filed, it gets a unique number. You can compare it with, say, the piece of paper you get when leaving your coat at the coat room. The client’s jacket is the issue, and we can then keep track of it using the unique number it was given. Customer questions can be sent to us through email or by clicking ‘Contact us’ on the support page. 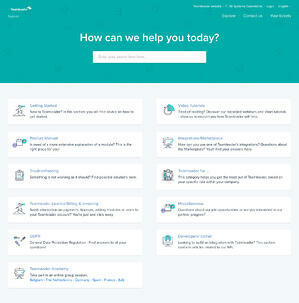 In both places, you will find the same support articles and resources. So it’s really just a matter of what you prefer! Tip: Webinars are short, interactive sessions in which we help you discover specific parts of Teamleader. At the end of each webinar, you can ask any question you may still have. You can watch pre-recorded webinars here. FAQ: why is my e-mail address blocked? “Just recently, for example, we wrote an article on how to create Gantt charts in Teamleader because we noticed lots of people were searching for that. The same goes for the article How to: advanced reporting with Teamleader and Cumul.io”. Also, these searches give us relevant information to improve our service altogether. Product Marketer Diederik Syoen: “if many users browse the Support Page for a certain topic, this tells us the process may not be as intuitive as we had intended it to be. A first step is to document the process more clearly on the Support Page, but it also reveals how we could improve and simplify that particular process within the application." No luck on the support page? Send us a ticket! If you couldn’t find the answer to your question in a support article, it may be time to send us a support ticket. 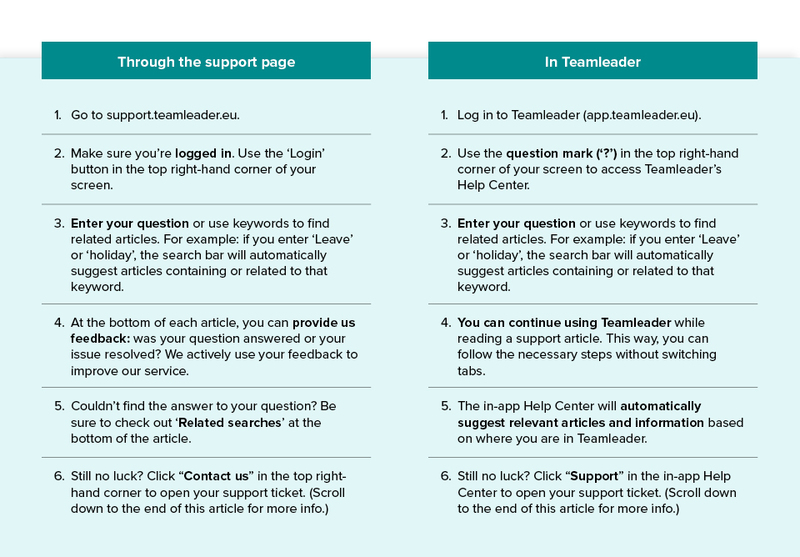 As mentioned earlier, you can do this by emailing support@teamleader.eu. Or you could open a new ticket in just a few clicks on the support page. The more information we have, the faster we are able to help you. If both the support page and the ticket you opened didn’t lead to a solution, we may invite you for a quick call. Our team won’t rest until your issue is resolved! Any feedback, suggestions or questions to share with us? Don’t hesitate to reach out - we’re always here to help.